Donald Trump gave Kim Jong Un both Korean and English-language versions of the US position at Hanoi's Metropole hotel on February 28, according to a source familiar with the discussions. A lunch between Donald Trump and North Korean leader Kim Jong Un was cancelled the same day. On the day that their talks in Hanoi collapsed last month, US President Donald Trump handed North Korean leader Kim Jong Un a piece of paper that included a blunt call for the transfer of Pyongyang's nuclear weapons and bomb fuel to the United States, according to the document seen by Reuters. Trump gave Kim both Korean and English-language versions of the US position at Hanoi's Metropole hotel on February 28, according to a source familiar with the discussions, speaking on condition of anonymity. It was the first time that Trump himself had explicitly defined what he meant by denuclearisation directly to Kim, the source said. A lunch between the two leaders was cancelled the same day. While neither side has presented a complete account of why the summit collapsed, the document may help explain it. The document's existence was first mentioned by White House national security adviser John Bolton in television interviews he gave after the two-day summit. Bolton did not disclose in those interviews the pivotal US expectation contained in the document that North Korea should transfer its nuclear weapons and fissile material to the United States. The document appeared to represent Bolton's long-held and hardline "Libya model" of denuclearisation that North Korea has rejected repeatedly. It probably would have been seen by Kim as insulting and provocative, analysts said. 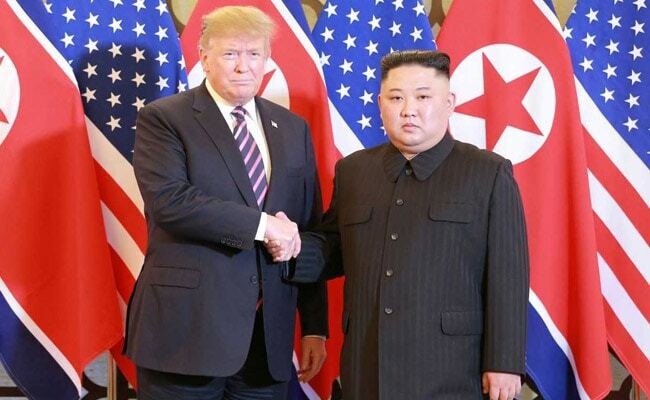 The document was meant to provide the North Koreans with a clear and concise definition of what the United States meant by "final, fully verifiable, denuclearisation," the source familiar with discussions said. The English version of the document, seen by Reuters, called for "fully dismantling North Korea's nuclear infrastructure, chemical and biological warfare programme and related dual-use capabilities; and ballistic missiles, launchers, and associated facilities." It called on North Korea to provide a comprehensive declaration of its nuclear programme and full access to US and international inspectors; to halt all related activities and construction of any new facilities; to eliminate all nuclear infrastructure; and to transition all nuclear programme scientists and technicians to commercial activities. The summit in Vietnam's capital was cut short after Trump and Kim failed to reach a deal on the extent of economic sanctions relief for North Korea in exchange for its steps to give up its nuclear programme. The first summit between Trump and Kim, which took place in Singapore in June 2018, was almost called off after the North Koreans rejected Bolton's repeated demands for it to follow a denuclearisation model under which components of Libya's nuclear programme were shipped to the United States in 2004. Seven years after a denuclearisation agreement was reached between the United States and Libya's leader, Muammar Gaddafi, the United States took part in a NATO-led military operation against his government and he was overthrown by rebels and killed. The Hanoi document was presented in what US officials have said was an attempt by Trump to secure a "big deal" under which all sanctions would be lifted if North Korea gave up all of its weapons. US-North Korean engagement has appeared to be in limbo since the Hanoi meeting. Pompeo said on March 4 he was hopeful he could send a team to North Korea "in the next couple of weeks," but there has been no sign of that. Jenny Town, a North Korea expert at the Washington-based Stimson Center think tank, said the content of the US document was not surprising. "This is what Bolton wanted from the beginning and it clearly wasn't going to work," Town said. "If the US was really serious about negotiations they would have learned already that this wasn't an approach they could take." North Korea has repeatedly rejected unilateral disarmament and argues that its weapons programme is needed for defence, a belief reinforced by the fate Gaddafi and others. In an interview with ABC's "This Week" programme after the Hanoi summit, Bolton said the North Koreans had committed to denuclearisation in a variety of forms several times "that they have happily violated." "We define denuclearisation as meaning the elimination of their nuclear weapons programme, their uranium enrichment capability, their plutonium reprocessing capability," Bolton said.